Two small statues dating to the 10th century were discovered in Banteay Srey last week during the excavation of a water channel. Authorities at the Angkor Temple Complex in Siem Reap province yesterday announced the discovery of two statues dating from the 10th century, uncovered during the digging of a water channel. In a statement released on its website, the Apsara Authority, which runs and manages the Unesco World Heritage site, said the two statues will be sent to archaeologists for research purposes. “We found them while digging a small canal around the Banteay Srey temple,” said Apsara Authority spokesperson Chao Sun Kerya. 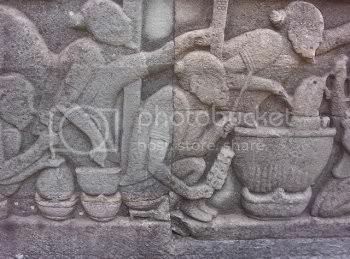 The canal is intended to hold rainwater runoff currently gathering in the temple. More than 200 tourists had to be evacuated by helicopter from the Angkoran temple of Banteay Srei after flash floods cut off road access. 28 July 2007 (The Courier Mail) – A travel piece about the Angkor temples in Cambodia, skimming over Angkor Wat, Angkor Thom, Preah Khan and Banteay Srei. Has some practical advice in avoiding the crowds too, although be careful about several spelling errors in the text (eg, Banteay Srei, Suryavarman II). I always thought that visiting Cambodia’s Angkor temples would be like exploring a lost city. For many years I had heard tales of crumbling ruins hidden from time by steamy triple-canopy jungle that echoed with birdsong and the call of mysterious animals. I imagined walking along jungle tracks, coming upon a faded ruin only after the last strike of a guide’s machete cleared an overgrown patch of scrub. But the reality of Siem Reap’s Angkor is this: hordes of tourists and well-worn paths leading to crowded temples. Pick the wrong time of the day to visit Angkor Wat, the most famous of the region’s temple complexes and the symbol on the Cambodian flag, and you’ll be sharing the site with thousands. The tour buses start arriving mid-morning and drop their passengers on the other side of the moat, with tourists flooding across the Naga Causeway to the dusty temple compound. While Angkor is now firmly on the tourist track there are still ways to guarantee that you get to see the temples without being surrounded by hundreds of other people, and one is to pick the time of the day you visit. Start early, and head into the temples while they are still quiet. Read the full travel piece on Angkor here. 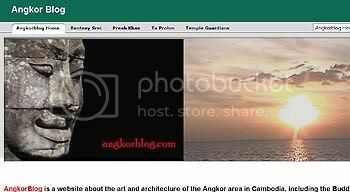 Keeping with the Angkor theme for this past few days, here’s a website I found about the art and architecture of Angkor, the Angkor Blog. The name is really a misnomer – it’s not really a blog, but rather a well-indexed information site. Sidestepping the usual touristy information about Angkor Wat and how to get around Siem Reap, this site focuses mainly on the temples, the iconography and the mythology that is depicted on the bas-reliefs and scultpure of Angkor. Plenty of pictures and videos so that you know what is being talked about, as well as links to primary texts like the Mahabharata and the Ramayana to explain the various events depicted in art. That’s it for the series of features on Angkor! If all goes well, I should be returning home today and archaeological news updates will resume tomorrow.